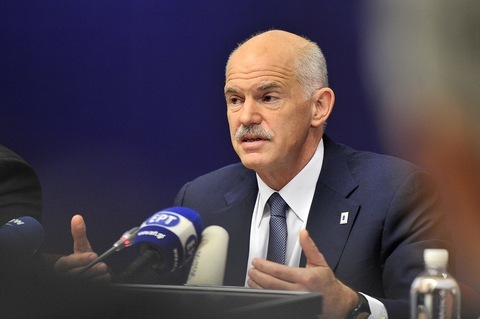 Greek Prime Minister George Papandreou speaks Thursday at a press conference after a eurozone summit at EU headquarters in Brussels. Photo by Georges Gobet/AFP/Getty Images. At an emergency summit in Brussels, European leaders reached a debt crisis deal in which banks would accept a 50 percent loss on Greece’s debt and the eurozone’s bailout fund would grow to roughly 1 trillion euros, a deal that bolstered European markets and eased fears of an imminent Greek default. Banks also have been asked to boost their own capital to shield themselves from potential default losses. Further action is needed to restore confidence. That is why today we agree on a comprehensive set of additional measures reflecting our strong determination to do whatever is required to overcome the present difficulties and take the necessary steps for the completion of our economic and monetary union. We fully support the ECB in its action to maintain price stability in the euro area. “We can claim that a new day has come for Greece, and not only for Greece but also for Europe,” said Greek Prime Minister George Papandreou. Under the framework, Greek’s debt burden would fall to 120 percent of its annual GDP by 2020. After all the buildup to this summit meeting, failure here would have been a disaster. While the plan to require banks to raise new capital was generally approved without difficulty — banks will be forced to raise about $150 billion to protect themselves against losses on loans to shaky countries like Greece and Portugal — the negotiations over the Greek debt were difficult. “The results will be a source of huge relief to the world at large, which was waiting for a decision,” President Nicolas Sarkozy of France said. Italy also has been under scrutiny for its debt burden, prompting Prime Minister Silvio Berlusconi to vow to balance the country’s budget and bring down its 1.9 trillion euro debt. Though the principles of the three-part deal were agreed upon in Brussels, the details will be outlined in November.